The « Sherpa Medium » family of 6×6 and 4×4 tactical trucks provides outstanding strategic and tactical mobility to military units operating in extreme conditions worldwide. The Sherpa Medium is also fitted for a protected cab (ballistic and mine kits) and a self defence weapon. The French Renault Sherpa 5 truck is a 20-ton class 6×6 all-terrain medium-weight military truck system able to carry 7-ton of cargo in support of combat units. 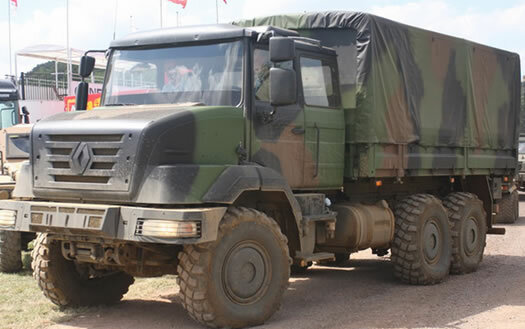 Several versions of this truck system have been developed by Renault Trucks Defense. Equipped with either a long cab or a short cab, Sherpa 5 truck is suitable for: relief and supply mission; troop transport (up to 20 fully-equipped infantrymen on a flatbed); servicing : light repairs; mobility support : tipper, tanker and clearance blade versions; and shelter transport (10-15 feet). It is powered by a six-cylinder Euro 4 compliant 240-hp DXi 7 diesel engine which provides a maximum range of 850 km at a cruising speed of 60 kph. The Sherpa 5 tactical truck is air transportable. 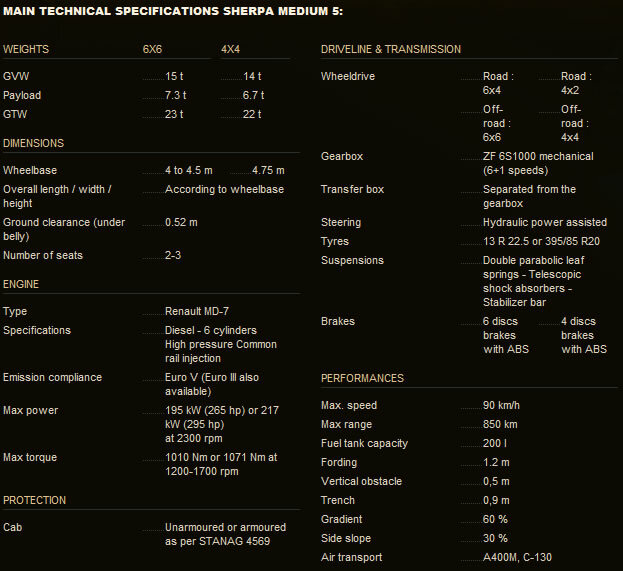 The fully airtransportable Sherpa 5 is able to transport up to 7 tonnes of payload. Several variants with different wheelbases are adaptable to any operator’s need: shelter carrier (10-15 feet), troop transport (up to 18 soldiers), tanker, weapon system carrier, etc. The Sherpa 5 is already operational in the French Army as an ammunition carrier and a self propelled howitzer (with a 155 mm gun). The vehicle chassis is used for the French CAESAR® 155mm SPG and resupply truck.